Uncovering the lost history of gay, lesbian, bisexual, and transgender artists in New York City. Queer people have always flocked to New York seeking freedom, forging close-knit groups for support and inspiration. 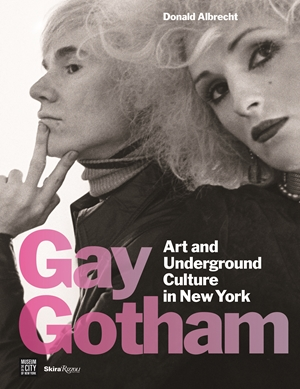 Gay Gotham brings to life the countercultural artistic communities that sprang up over the last hundred years, a creative class whose radical ideas would determine much of modern culture. More than 200 images—both works of art, such as paintings and photographs, as well as letters, snapshots, and ephemera—illuminate their personal bonds, scandal-provoking secrets at the time and many largely unknown to the public since. Starting with the bohemian era of the 1910s and 1920s, when the pansy craze drew voyeurs of all types to Greenwich Village and Harlem, the book winds through midcentury Broadway as well as Fire Island as it emerged as a hotbed, turns to the post-Stonewall, decade-long wild party that revolved around clubs like the Mineshaft and Studio 54, and continues all the way through the activist mobilization spurred by the AIDS crisis and the move toward acceptance at the century’s close. Throughout, readers encounter famous figures, from James Baldwin and Mae West to Leonard Bernstein, and discover lesser-known ones, such as Harmony Hammond, Greer Lankton, and Richard Bruce Nugent. Surprising relationships emerge: Andy Warhol and Mercedes de Acosta, Robert Mapplethorpe and Cecil Beaton, George Platt Lynes and Gertrude Stein. By peeling back the overlapping layers of this cultural network that thrived despite its illicitness, this groundbreaking publication reveals a whole new side of the history of New York and celebrates the power of artistic collaboration to transcend oppression.